I received an email from Denis Savard of the E3b Project, asking me to post the following for my readers. For the non-genetic genealogists, E3b is a Y-DNA Haplogroup (info here). The E3b Project was also ISOGG’s “DNA Project Website-of-the-Week” 14 Nov 2007. The worldwide E3b Project proudly announces a new milestone: reaching the 700 member mark. Since its launch this past June, the E3b project’s website (http://www.haplozone.net/e3b/project) has been steadily growing and is gradually being transformed into a dynamic place of learning, collaboration and research for all things related to E3b. + The new V-Series SNP tests have proven very popular among our E-M78 subclade participants and we have been very successful in further dissecting the E3b1a subclade into several distinct and finer branches. So far, about 70% of M78+ participants have also tested V13 ... Click to read more! 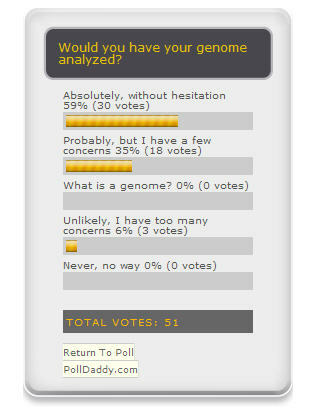 Poll Results – Are You Interested in Genomic Analysis? It looks as though many people are interested in genomic analysis, and that a significant number have some concerns that must be addressed or resolved before they would consider it. bbgm had a poll on his blog, with the results posted recently at “Your Personal Health: Readers Vote Yes“. Again, similar to my results, readers were interested in genomic analysis. ... Click to read more! It’s not a whole-genome scan or a genetic genealogy test, but it’s still a DNA test from the drug store shelves. Soon you will be able to purchase a paternity test from Rite-Aid. “The test, sold under the brand name Identigene, has a suggested list price of $29.99, though a reporter purchased one at a Rite Aid in Santa Monica, Calif., for $19.99. There is an additional laboratory fee of $119 to have the samples analyzed.” ... Click to read more! “We examined genetic diversity and population structure in the American landmass using 678 autosomal microsatellite markers genotyped in 422 individuals representing 24 Native American populations sampled from North, Central, and South America. The Native American populations have lower genetic diversity and greater differentiation than populations from other continental regions. We observe gradients both of decreasing genetic diversity as a function of geographic distance from the Bering Strait and of decreasing genetic similarity to Siberiansâ€”signals of the southward dispersal of human populations from the northwestern tip of the Americas” ... Click to read more! Hereâ€™s the question: Do people really make â€œlife-changingâ€ decisions based upon the results of a genetic genealogy test?This phrase is often stated but is seldom supported with actual facts or case studies.And Iâ€™ve certainly never seen an estimated percentage of people who have made these types of â€œlife-changingâ€ decisions, which would really help further the discussion. Earlier this month, Harvard Professor Henry Louis Gates, Jr. announced the launch of his new genetic genealogy company, AfricanDNA.com. According to the press release, â€œthe precedent-setting site is the only company in the field of genetic genealogy that will provide African Americans with family tree research in addition to DNA testing.” ... Click to read more! I’m sorry if I’ve overloaded you on the recent launches of 23andMe and deCODEme, but I think there’s so much to talk about. For a little lightheartedness, read “23andMe Party” from How to Change the World by Guy Kawasaki. Kawasaki describes a friends and family “Spit Party” hosted by 23andMe, and even has a number of pictures from the event. The party offered attendees the chance to submit their DNA for analysis at a discounted rate. Some of the attendees included co-founders Linda Avey and Anne Wojcicki, at least one Nobel Prize winner, and celebrities Goldie Hawn and Kurt Russell. I have been accused of being a little too thorough sometimes.All things considered, thatâ€™s a flaw that I can live with.In the name of thorough, I offer the following review of recent online references to this weekendâ€™s launch of personal genome analysis companies deCODEme and 23andMe.If youâ€™re tired of hearing about the topic feel free to skip this post, but if youâ€™re interested in the conversation that these launches have stimulated, read onward. Kara Swisher at All Things Digital recently toured the new offices of 23andMe.The article â€“ â€œKara Visits 23andMeâ€ â€“ has a brief write-up and three videos.The first video is Ms. Swisherâ€™s tour of the offices and includes an overview of the DNA collection kit and a brief interview with Linda Avey and Anne Wojcicki.The second and third videos are part of a longer interview with Avey and Wojcicki. ... Click to read more! Poll – Are You Interested in Genomic Analysis? Given all the recent activity in the field of personal genomic analysis, I was curious about how the readers of this blog felt about having their own genome analyzed. Here’s a poll that will give me a rough idea – please feel free to vote! If you’re reading this through a feed, you might have to stop by the blog to vote. The Genetic Information Nondiscrimination Act, known in shorthand as GINA, is federal legislation that would prohibit insurance companies from discriminating against an applicant based on genetic information, the refusal to submit genetic information, or for have been genetically tested in the past. The Act, if passed, would also prohibit employers from using or collecting genetic information to make employment decisions. I wrote a GINA Primer in April, if you’re interested in learning more about the Act (here’s the full text of the legislation). The Act, which is currently a bill before the Senate, easily passed the House of Representatives (97% voted aye), and President Bush has said that he would sign the bill into law if it reaches his desk. ... Click to read more! I have written a lot about the Mountain View based personal genome start-up company 23andMe (February 14th, April 9th, June 19th, July 31st, and September 13th, to name a few). As a matter of fact, if you google “23andMe”, The Genetic Genealogist is the second result. Today, announced by an article in the New York Times (My Genome, Myself: Seeking Clues in DNA) and Wired (23andMe Will Decode Your DNA for $1000. Welcome to the Age of Genomics), 23andMe has officially launched. If you visit 23andMe, you’ll notice that the site has been completely revamped, and they are now accepting orders for their Personal Genome Service, for $999. “In all, 23andMe looks at more than 500,000 SNPs scattered across the 23 pairs of chromosomes that constitute the human genetic sequence. We also look at a few thousand places on the mitochondrial DNA, an odd loop of genetic material outside the nucleus that is involved in producing energy for the cell.” ... Click to read more!